New research conducted and published by Training Industry, Inc. explores how corporate training can influence gender equity in the workplace, and provides five recommendations the learning and development function can follow to address the gender gap. 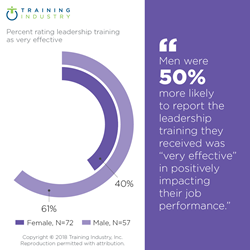 Exhibit: Men were 50% more likely to report the leadership training they received was "very effective" in positively impacting their job performance. The leadership development provided to women is not the same as the development provided to men. These gaps are greatest at the times in women's careers and in the fields where women need it the most. New research by Training Industry, Inc. finds leadership training gaps between men and women across industries. The findings are published in the research report “Women’s Access to Leadership Development: A Tale of Two Experiences,” which will be released on International Women’s Day, Thursday, March 8, 2018. The report’s co-authors will present a webinar highlighting the findings of this research on Thursday, March 8, at 11 a.m. Eastern Time. To register for this webinar, visit www2.trainingindustry.com/womeninleadership. Men are 50 percent more likely to rate the leadership training they receive as “very effective” in positively impacting their job performance. Managers’ support of employees’ leadership development is especially beneficial for women. Specific training in leadership skills like strategic thinking and negotiation tends to be offered more frequently to men than women at upper levels of organizations. Leadership performance was found to be higher for those who had received negotiation skills training, and existing research shows that negotiation skills become more important as leaders advance. Leadership coaching can serve as an equalizer; the difference in men’s and women’s ratings of training effectiveness is reduced when coaching is used as a modality. Women are at the greatest disadvantage for accessing leadership training in traditionally male-dominated fields. Promote managers’ support of leadership training, which will benefit both genders but especially will help women pursue the development opportunities that will help them advance. Be strategic when choosing training modalities for multi-modal programs to ensure training is delivered in a way that is most effective for both men’s and women’s learning preferences. Provide formal coaching, tailored to women’s needs, as well as on-the-job coaching. Measure and report on leadership training as well as both genders’ participation and success. Target specific skills throughout women’s careers, regardless of the field, to help mitigate the gaps in training at the career moments when effective leadership training is most needed. The research report will be available on March 8 at www2.trainingindustry.com/womenleadershipreport. A wait list is available before the report release date.